Are you looking to print high quality EAN 13, Code 39, I2of5 , Code 128, UCCEAN (GS1-128), UPCA, I2of5, GS1 Databar 14, PDF417, QR Code or DataMatrix barcodes for your business? If so, you have come to the right place. 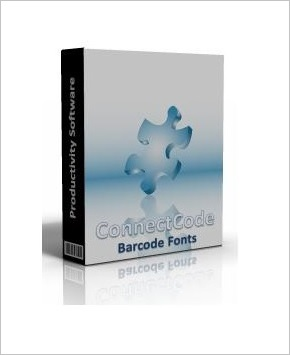 We offer a complete and professional barcode software and fonts package, ConnectCode, to help you with your design and printing. ConnectCode can be used independently with our software Encoder or with other softwares such as your text editor, graphics software, Excel, Access, Word, Crystal Reports, Reporting Services, Oracle, App for Office and Visual Studio projects. The fonts are field tested and has proven to be extremely flexible in meeting the changing demands of your business. Our products are designed with simplicity in mind and does not require you to invest significant amount of time and effort. We also hope to provide you with good support by treating your satisfaction as our paramount goal. 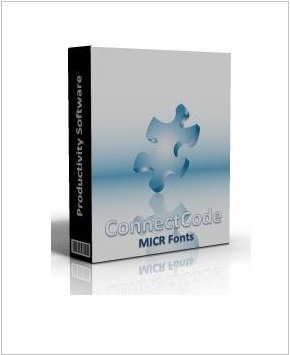 The versatility of this fonts package makes it easy for you to enable barcodes in office applications, third party software, databases and reporting software that support text display. ConnectCode comes bundled with an advanced software Encoder that helps you validate data input, generate check digits and add start/stop characters. A special feature creates images out of the barcode fonts, while giving you flexibility in setting the resolution, dimensions and boundaries of the resulting bitmaps. There are also Word/Excel Macros, Oracle and Crystal Reports formulas included to carry out the tasks of the Encoder mentioned above. Sample source code also provides reference implementation of the Encoder if you are thinking of bundling our fonts with your application. Our products comes in various licenses so that you can choose to use them in a single computer, in unlimited computers in your organization or for bundling in your own applications. Our products come with free technical support from our experienced staff. Free barcode fonts (v5.0) are also available for download on our website. PDF417 is one of the earliest and most widely used 2-dimensional barcode. It is a stacked barcode composed of rows of linear barcode. Being a 2-dimensional barcode allows it to carry more information than the 1-dimensional barcodes. QR Code (Quick Response) is a 2-dimensional barcode consisting of black square patterns on a white background. The barcode is capable of storing more information than a conventional barcode. It is developed by Denso-Wave and is one of the more popular 2-dimensional barcodes. DataMatrix is a two-dimensional matrix symbology made up of square modules arranged in a square or rectangle shaped pattern. This barcode is capable of packing large amount of data and has the capability of recovering the original data encoded even when it is partially damaged through an error correction technique. ConnectCode SDK is an advance and modern .Net compliant barcode generation Software Development Kit (SDK). It supports all commonly used linear barcodes in the industry including the modern GS1 Databar and is one of the most flexible barcode SDK available. This Barcode SDK is uniquely designed to achieve maximum scalability and flexibility for your project. Due to this unique design, it is so powerful that you can use it to create barcodes for almost any scenarios in the Windows Operating System. This is a Magnetic Ink Character Recognition font based on the E13-B (ISO 1004) industry standard for check processing. E13-B is widely accepted in the US, Canada, Australia and many other countries. The character set of this standard comprises of ten numbers (0..9) and four special symbols(Amount, Domestic, BSB and Dash). The font package includes TrueType fonts, Calibration fonts, PostScript fonts and OpenType fonts. This is a Magnetic Ink Character Recognition font based on the CMC-7 (ISO 1004) industry standard. CMC-7 is a widely accepted standard throughout Europe, South America and many other countries. The character set of this standard comprises of ten numbers (0..9), five special symbols and twenty-six letters. This is a free security font used to print text and amounts on secure documents e.g. a bank check. The secure documents require capabilities to prevent forgery and easy alteration. The app is bundled with over 900 industry label stock templates and 150 clip arts, and generates commonly used barcodes via font technology. It also supports vector shapes such as rectangle, ellipse, line, and both static and dynamic text/barcode fields. Users will be able to retrieve address and contact information from the Microsoft Excel and People's app with just a few taps and have the information printed out in a snap. ConnectCode Label Software is an industrial strength label printing application with a What-You-See-Is-What-You-Get (WYSIWYG) user interface for the Windows desktop. It is equipped with over 1000 industry label templates, supports all commonly-used 1-dimensional barcodes which can be printed using inkjet, laser, multi-function, thermal and thermal-transfer printers. It is one of the most innovative label printing application in the market with advanced capabilities such as International Text, Duplex printing, TWAIN image acquisition and label templates management. ConnectCode Barcode Imager allows you to generate professional barcode images that are highly scannable. These images can be opened in other applications for futher layout and printing. ConnectCode Imager supports popular image formats including Portable Network Graphics, Graphics Interchange, Windows Bitmap, Tagged Image File and Jpeg. The tool is very flexible. It lets you to generate images of various resolutions to cater to different printers and applications.